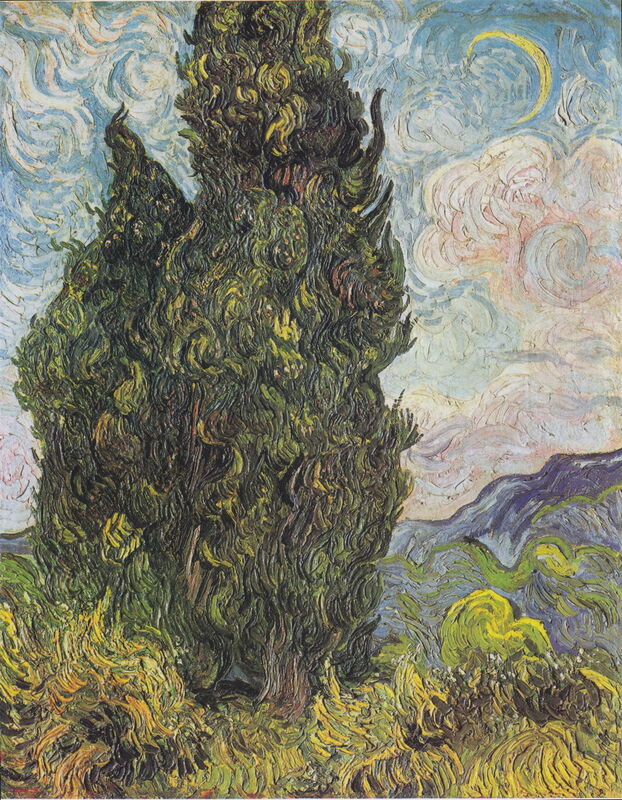 Vincent van Gogh, Cypresses (1889), oil on canvas, 93.4 x 74 cm, The Metropolitan Museum of Art, New York, NY. Wikimedia Commons. Any exhibition of the work of Vincent van Gogh (1853-90) should be a great success, given his enduring (and deserved) popularity. This large format and excellently illustrated book accompanies the current exhibition at The Clark, in MA. Whilst the exhibition offers those able to attend an excellent opportunity to enjoy 49 of his works, both drawings and paintings, if this book is to function as anything more than a catalogue, it needs to break new ground – not an easy task given the already copious literature and its thorough coverage. At the start of its introduction, the authors admit to appealing to the large group of those who already admire van Gogh’s work, and their intention to deepen and enrich appreciation among those admirers. They claim that his engagement with “the natural world” is a crucial but “still widely underestimated” aspect of van Gogh’s career as a painter, and propose that this exhibition and book are the first to address van Gogh’s relationship with nature as a whole. 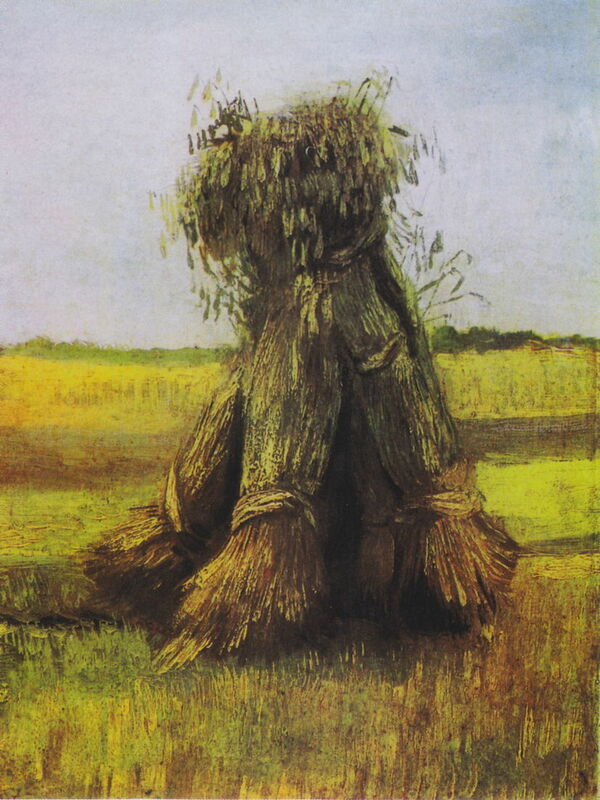 Vincent van Gogh, Sheaves of Wheat (1885), oil on canvas, 40.2 x 30 cm, Kröller-Müller Museum, Otterlo, the Netherlands. Wikimedia Commons. With their combined profound knowledge and understanding of both visual and textual information about van Gogh and his work, no image or writing has been left unturned in their research. This includes van Gogh’s letters to contemporary scientists such as Charles Darwin and Louis Pasteur, and two specimens of seaweed which he sent to his brother Theo from Ramsgate. We are treated to wonderful insights into the riches held by the Van Gogh Museum, including a spread of text and an ink sketch of pollarded willows along a road, from letter 175. 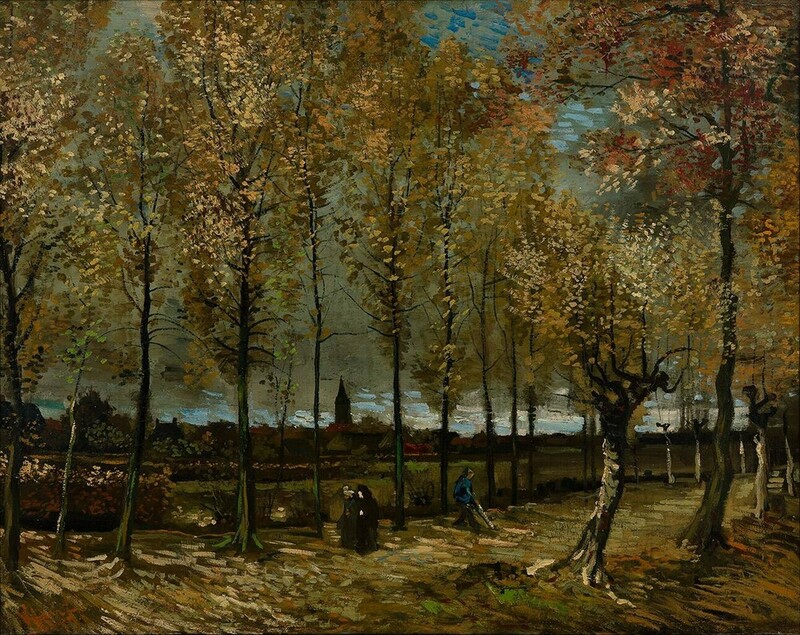 Vincent van Gogh, Poplars near Nuenen (1885), oil on canvas, 78 x 98 cm, Museum Boijmans Van Benningen, Rotterdam. Wikimedia Commons. After this introduction, Stolwijk presents a masterly account of van Gogh’s formative work in Holland in the period 1881-5, culminating in his first major landscapes of 1885, and echoed in the later Reminiscences of Brabant (1890). These are referred to the paintings of other artists, which are not always reproduced at sufficient size to appreciate them; it is also sad that, whilst the reader can make such comparisons, those related paintings have not been included in the exhibition. 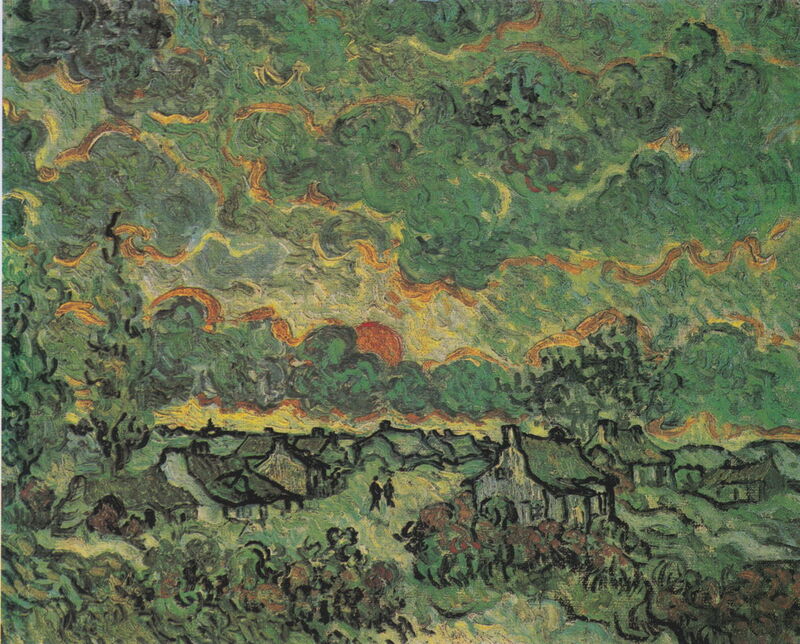 Vincent van Gogh, Reminiscence of Brabant (1890), oil on panel, 29.4 x 36.5 cm, Van Gogh Museum, Amsterdam. Wikimedia Commons. Perhaps the most important question about van Gogh’s relationship with nature is how ‘special’ it was. Every good artist who paints from nature develops a deep relationship, but it may be on the basis of the perception of nature (e.g. Cézanne’s sensations) rather than from any thorough understanding. Knowing all the different colours and textures of meadow grasses is part of the insight gained by any good landscape artist; knowing the scientific names of the different species, and knowing a panicle from a corymb is something altogether different, and really special. The second chapter, by Kendall, therefore explores how special this relationship was. Although van Gogh was clearly a wide and voracious reader, at a time when natural history was flourishing, Kendall’s examples of van Gogh’s reading remain squarely in the realms of the ‘popular’, books such as Théophile Gautier’s La Nature chez elle (1870). Kendall considers a group of anomalous drawings made by van Gogh when he was in Paris between 1886 and early 1890, which include four swifts and a barn owl (1887), and their inspiration, but is ultimately forced to conclude that, whilst absorbed by nature, van Gogh had a smattering of science and natural history, rather than any deeper knowledge. Few of these drawings transferred into paintings, but the exhibition includes two canvases, from 1889, in which a moth, butterflies, and plants do. 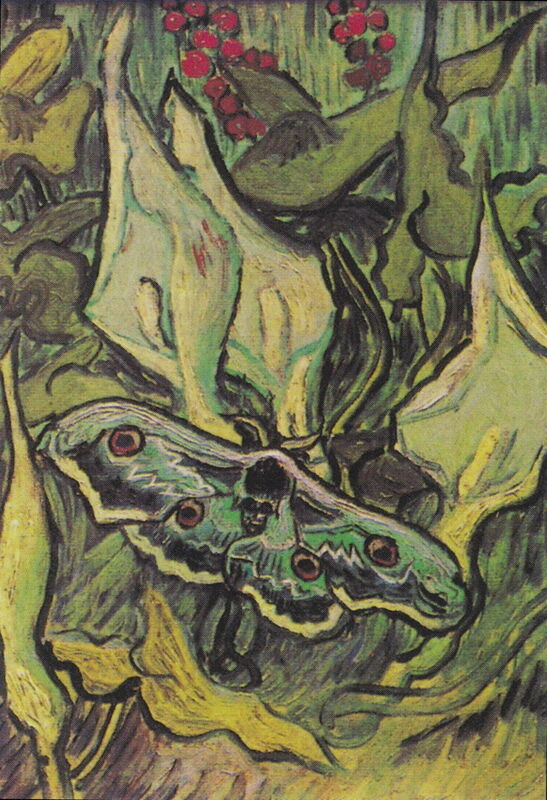 Vincent van Gogh, Giant Peacock Moth (1889), oil on canvas, 33.5 x 24.5 cm, Van Gogh Museum, Amsterdam. Wikimedia Commons. This leads Kendall to the third chapter, in which he examines the two years that van Gogh spent in Paris, apparently as a painter “of modern life” rather than nature. Unfortunately this is a period for which documentary evidence is more sparse, but there is valuable discussion of van Gogh’s responses to Impressionism, and how he decided to continue to paint towards his own goals, in which colour was a key feature. This leads on to discussion of van Gogh’s floral paintings, which largely relies on the earlier study by Coyle of The Still Life Paintings of Vincent van Gogh (2007). Vincent van Gogh, Square Saint-Pierre, Paris (1887), oil on canvas, 59.4 x 81.3 cm, Yale University Art Gallery, New Haven, CT. Wikimedia Commons. The van Gogh brothers took modestly-priced accommodation at the edge of Montmartre, and Vincent’s paintings of local gardens is the next theme examined. Kendall considers this with the evidence in several of the paintings in the exhibition, and well illustrated in this book. 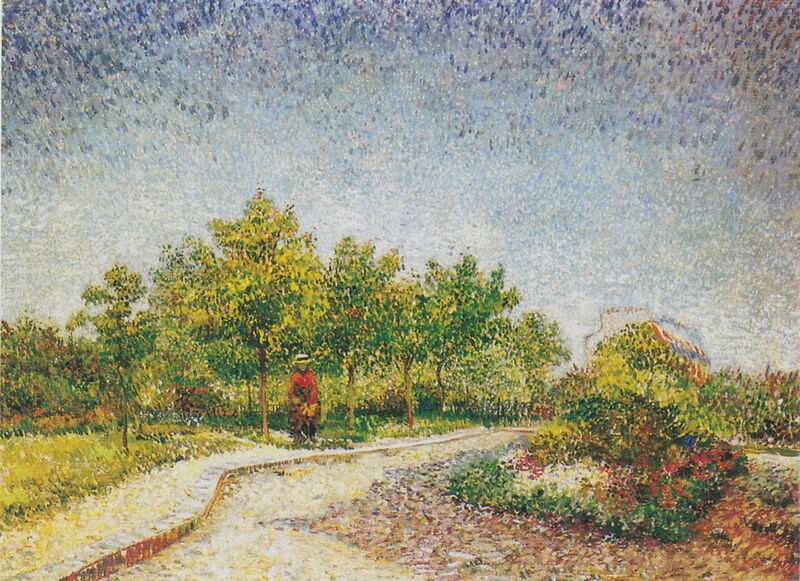 These include one of the most remarkable, both for its motif and van Gogh’s overtly pointillist technique, in Square Saint-Pierre, Paris (1887), which has elsewhere been named after a different location in Asnières. 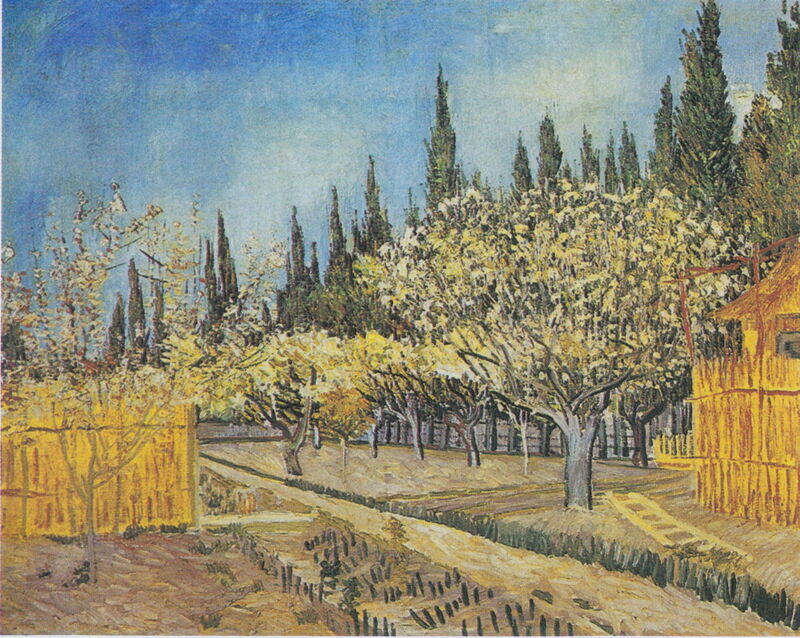 Vincent van Gogh, Orchard Bordered by Cypresses (1888), oil on canvas, 64.9 x 81.2 cm, Kröller-Müller Museum, Otterlo, the Netherlands. Wikimedia Commons. In the fourth chapter, van Heugten finally takes us south to Arles and Saint-Rémy for the last and phenomenally productive years of van Gogh’s life. Again some of the illustrations of paintings not included in the exhibition are frustratingly small, but he expertly details van Gogh’s exploration of light and nature, with the new inspiration of Japonisme. Here the book, with its wider range of images, is probably better than the exhibition, which has to make do with only Orchard Bordered by Cypresses (1888) as its example of van Gogh’s remarkable paintings of trees in blossom. However there are good examples of his drawing with a reed pen. 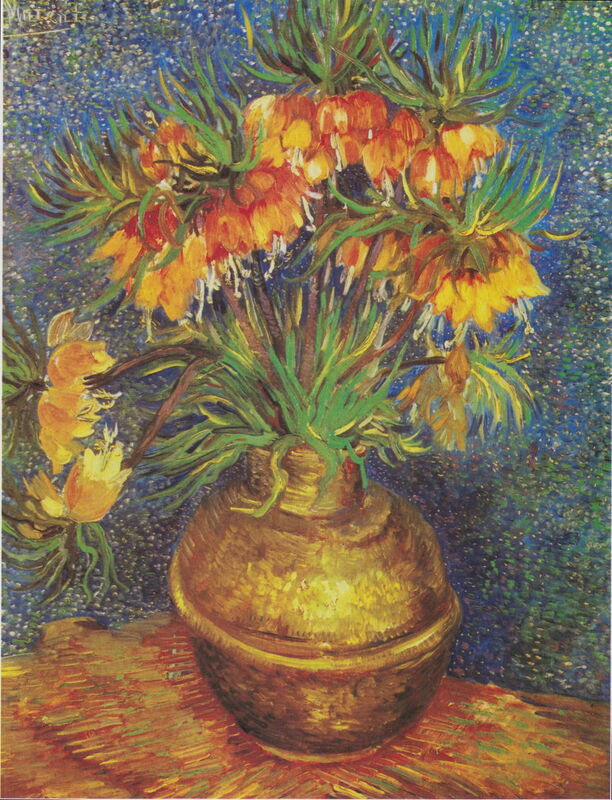 Vincent van Gogh, Imperial Crown Fritillaries in a Copper Vase (1887), oil on canvas, 73.3 x 60 cm, Musée d’Orsay, Paris. Wikimedia Commons. Van Heugten examines the train of thought which lay behind van Gogh’s paintings of the wheat cycle, represented by the glorious The Sower (1888), and leads through paintings of gardens and parks to a short discussion of the inevitable sunflowers. His stay at Saint-Rémy brought a return to drawing, and affirmation of the importance of nature. Van Heugten examines their rich succession of motifs, from nocturnes to rocky landscapes, and of course the distinctive cypresses. Kendall draws the book to a close with his account of van Gogh’s final months in Auvers-sur-Oise. This short chapter suggests that, when van Gogh reached his peak, with paintings such as Wheatfield with Crows (1890), perhaps his relationship with nature was ebbing, although there were still additions to the wheat cycle. The book ends with another reference to Japanese influence (in this case a print by Utagawa Hiroshige which I will shortly feature in another article here) in Rain – Auvers (1890). Vincent van Gogh, Rain – Auvers (1890), oil on canvas, 50.3 x 100.2 cm, National Museum of Wales, Cardiff. Wikimedia Commons. End matter includes notes, which are brief but cue in to the literature, a checklist of the 49 works in the exhibition (Landscape from Saint-Rémy, 1889, failed to make the journey from Copenhagen), and a single index. There is no separate bibliography or references, which is a shame. Although Kendall and his colleagues have produced a compelling exhibition and an essential companion to it in this book, I am not entirely convinced that the book will change our appreciation of van Gogh’s work. They do establish that his interest in nature was more than purely visual, or that based on his sensations alone. They add insight into his influences and motivation, and that nature is a sound theme on which to base an exhibition, and this book. However the evidence which they produce supports van Gogh having had a lay interest in natural history, rather than any more profound or scientific approach to the subject. If you are able to get to the exhibition, then do so, armed with this book as a guide and extension. If you like van Gogh’s work, then you should buy this book as it is a significant contribution to the literature, and you will almost certainly find plenty of interest in its pages, some of which should gently surprise. But I do not think that it fundamentally changes our understanding of van Gogh. Exhibition: Van Gogh and Nature, The Clark Art Institute, Williamstown, MA, 14 June to 13 September 2015, details here. Hurry along before it closes. The nine paintings included in this review are among those shown in the exhibition, and in the book. There are 40 more superb works by van Gogh in the exhibition, and many many more in the book. Posted in Painting and tagged book, landscape, natural history, nature, review, van Gogh. Bookmark the permalink.